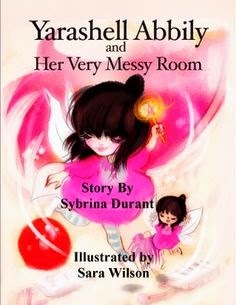 "Yarashell Abbily and Her Very Messy Room," by Sybrina Durant, is a picture book about three-year-old Yarashell who loves to make a mess in her room. Aimed at two to seven-year olds, the book is airly simple to follow. Yarashell explains her messing ritual as she tosses clothes everywhere until she is reprimanded by her mother. Fortunately, Dad arrives at the scene and comes up with a happy compromise to the mess that makes everyone happy. The book's writing is perfect for the age group, with simple words and a fun rhyming scheme. The illustrations are colorful, vibrant and a great addition to the story. One of the book's greatest assets is its theme - messy rooms! Almost every kid and parent can relate the topic of cleanliness, and this book does a great job dealing with it. As an added bonus, the author, Sybrina Durant, also wrote a song for the book, which can be heard on her website. Overall, if you have a young child who enjoys pictures books, he or she would definitely enjoy "Yarashell Abbily and Her Very Messy Room."